Stewart Stevenson, MSP for Banffshire & Buchan Coast this week asked the Minister for Children and Young People, Aileen Campbell, what the Scottish Government is doing to ensure that children get the best start in life. Stewart Stevenson, MSP for Banffshire & Buchan Coast, and Jacqueline Hay of Museums Galleries Scotland (MGS) visited Portsoy Salmon Bothy as part of a series of MSP visits to museums organised by MGS. The museums national development body has invited all of Scotland’s MSPs to champion their local museums by experiencing first-hand their achievements and challenges. “We are delighted to welcome Stewart Stevenson MSP and the representative from Museums Galleries Scotland to our museum. We have recently been awarded accreditation by MGS and are pleased to have them at our volunteer training day as we prepare for the new season. Last year the Salmon Bothy had to reduce their opening hours from six days to four as volunteers retired or moved away. This year they will open Thursday, Friday, Saturday and Sunday from 2.00pm-4.00pm and by appointment. 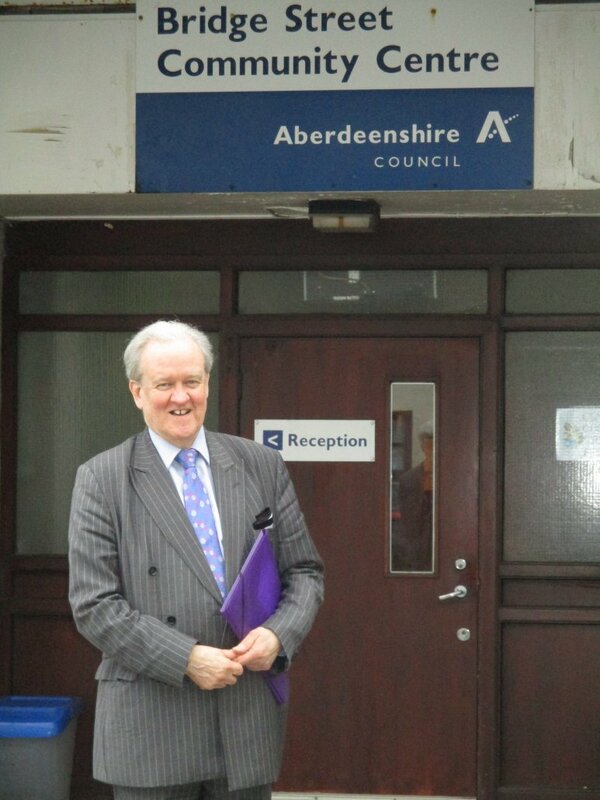 Banffshire & Buchan Coast MSP Stewart Stevenson has held his final round of surgeries prior to Parliament being dissolved for the elections on May 5th. The SNP MSP held surgeries on Friday in Banff and Fraserburgh, bringing the total number of surgeries he has held during this Parliamentary session to 265. Since being elected in 2001, Stewart has held an impressive 965 surgeries in total across every community in his constituency. “In addition, I hold surgeries at summer events and shows so that people can meet me at their convenience. “The Bill also introduces a new system of redress for landlords and tenants through the new First-tier Housing and Property Tribunal. Housing Minister Margaret Burgess announced this week that there will be no fees for tenants or landlords taking their case to the Tribunal if the SNP are re-elected for an historic third term. Local MSP Stewart Stevenson has presented a £150 boost to a local fundraiser courtesy of an interview he took part in recently. Research firm Ipsos MORI asked the MSP to take part in an interview and offered a donation to charity if he agreed to take part. Mr Stevenson did so and nominated the Cystinosis Foundation as the worthy recipient. 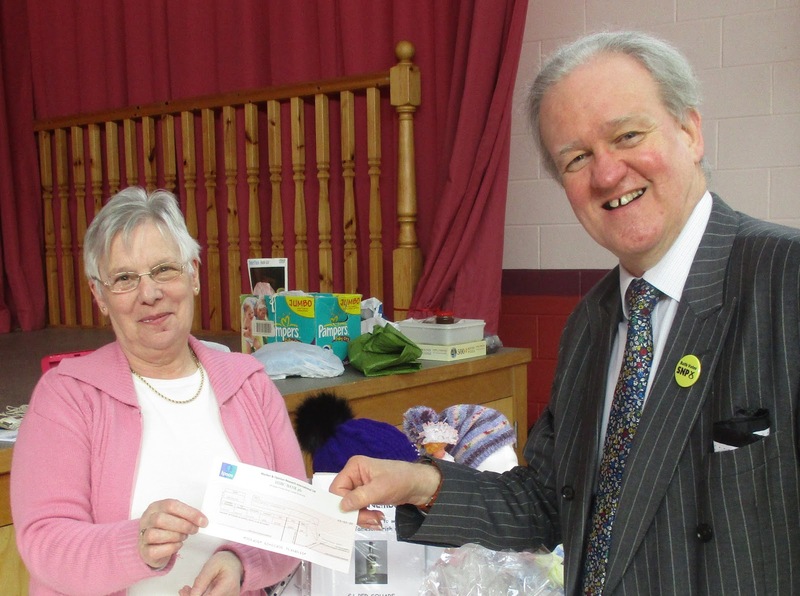 Mr Stevenson presented the cheque to Fraserburgh woman Mrs Elizabeth Forsyth who is a well-known local fundraiser for the charity at one of her charity stalls recently. 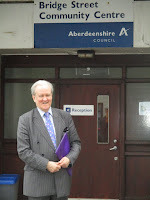 Stewart Stevenson, MSP for Banffshire & Buchan Coast, this week asked the Minister for Learning, Science and Scotland’s Languages, Dr Alasdair Allan, what the Scottish government is doing to promote science, technology, engineering and mathematics in schools. The Minister responded by explaining that the Scottish Government had announced £1.5 million of funding to support science, technology, engineering and maths in primary and secondary schools. Mr Stevenson went on to ask what steps the Scottish government are taking to address the challenges faced for teacher recruitment in STEM subjects. 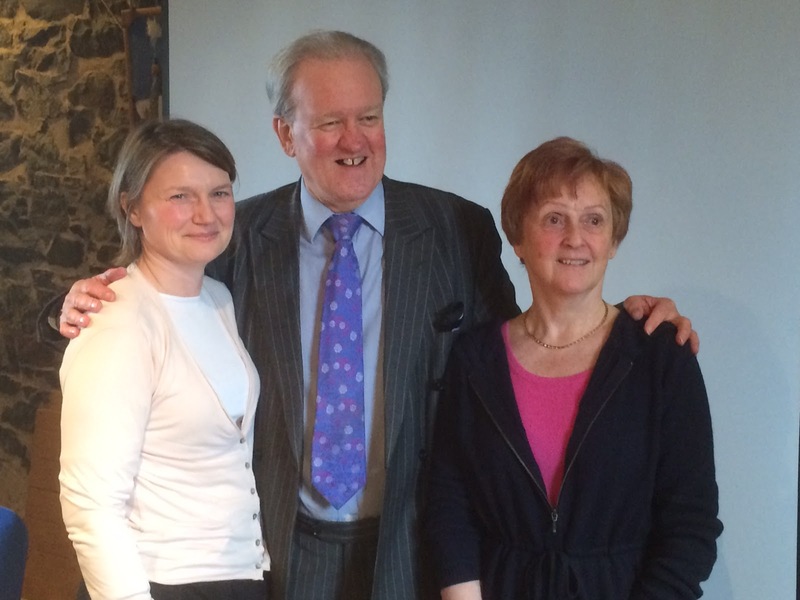 Angus Robertson MP has met with BT following a public meeting held in Buckie recently on the issue of Broadband. Meanwhile Mr Robertson’s SNP colleague Stewart Stevenson MSP has called on BT to up their game locally. “A good range of issues were raised at the public meeting in Buckie covering both standard broadband and fibre broadband issues in and around the town. “At that meeting I committed to taking these issues up with BT and I have now met with senior BT representatives who have taken away the concerns that were raised. They have also encouraged people to continue raising any concerns as it is important to identify times, locations and frequency of any problems. “I also raised the issue of lack of fibre coverage in some communities and there may well be some further progress on this in the near future. “It's quite clear that BT need to up their game locally. There is a great deal of frustration in the area at the standard of service people are receiving. At the end of the day, BT are a commercial organisation and commercial organisations live or die by the customer service they provide. BT have an opportunity here to step up and prove to people in Banffshire they are a company worthy of their custom." Banffshire & Buchan Coast SNP MSP Stewart Stevenson has said today’s announcement from the Scottish Government of a “revolution in rail” in Scotland, which will deliver the largest programme of benefits to rail passengers seen in a generation – with a particular emphasis on additional services and seats in the North-east – strengthens the case for extending the rail network into Buchan. Scottish Government Transport Minister, Derek Mackay, today announced that ScotRail will introduce 200 new services, providing 20,000 more seats per day, with passengers across Tayside, Stirlingshire, Perthshire, Aberdeenshire and the Borders set to feel the benefits. Timetable improvements are made possible by the decision by the Scottish Government to retain 13 additional Class 170 diesel trains (39 additional carriages) beyond the terms of their current leases, which were due to end in 2018. These extra trains create the capacity to make timetable service improvements – with input supplied by local stakeholders to find the best fit for local priorities. This improvement will provide for a half hourly service from Inverurie to Aberdeen. Completion of the upgrade of the Aberdeen to Inverurie line will help facilitate this. “This announcement today by the Transport Minister is very good news for rail travellers in the North-east. In particular, reduced journey times to Glasgow and Edinburgh will be of great benefit to travellers. “We have initiated a revolution in rail services across Scotland. From 2018 passengers will benefit from more seats, more services and faster journey times as a direct result of the increased funding that we are putting into the rail network. “The retention of these units will complement the arrival of our new High Speed Trains, which will allow for new and improved intercity connections. They will also make our rail network more resilient, creating opportunities to run faster services on key commuter routes and offering better connectivity for regional areas. “This is a really significant moment in our mission to transform Scotland’s railway. 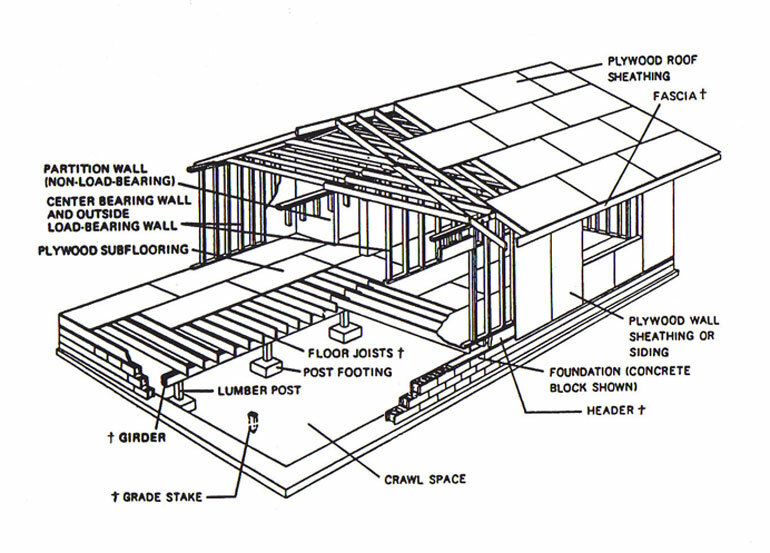 In three years time, the service that we provide to our customers will be unrecognisable. Our new electric fleet will be running between Glasgow and Edinburgh, our High Speed trains will be linking our seven cities and, thanks to this announcement today, we will have hundreds more services and thousands more seats available to customers across Scotland – particularly in Aberdeen, the North East and Fife. 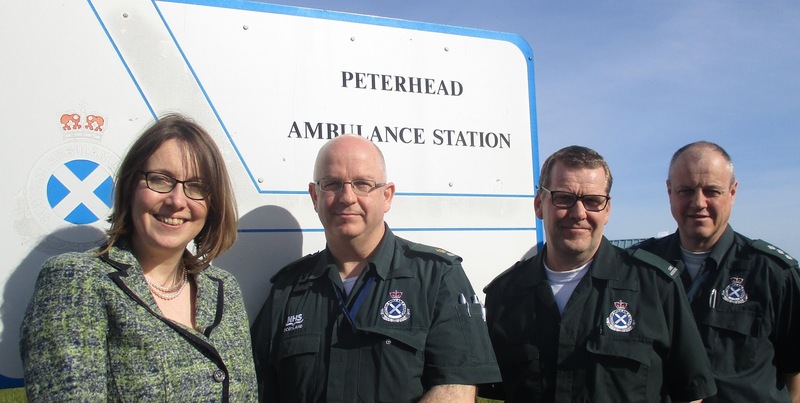 The announcement follows a sustained campaign by the MSP and MP for enhanced ambulance provision in the north of Aberdeenshire, and builds on earlier commitments to increased provision and a recruitment drive. 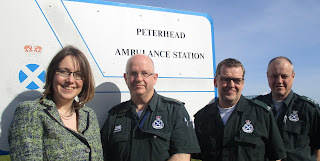 As a result of today’s announcement, the Scottish Ambulance Service stands to benefit from a £5 million injection from the Scottish Government. Banffshire & Buchan Coast MSP Stewart Stevenson hosted a meeting for local fishermen and those involved in the fishing industry last week. Fisheries Secretary Richard Lochhead MSP addressed the meeting and took questions from the floor. The meeting was chaired by Stewart Stevenson and took place at Findlay’s Hotel in Fraserburgh. “I’m very pleased that Richard Lochhead again agreed to do another of these events in my constituency. The idea originally arose out of a conversation with one of my constituents on fishing issues and we tried this out a couple of years ago and got a very good turnout, so we were keen to offer people the opportunity once again. “I was very pleased at the turnout we got, which filled our venue to capacity. I think it is vitally important that opportunities are arranged to allow local fishermen and those involved in the industry the chance to put their views directly to the Cabinet Secretary as well as hear from him on a range of issues. Banffshire & Buchan Coast MSP Stewart Stevenson has welcomed the announcement from First Minister Nicola Sturgeon that farmers and crofters still waiting for a direct subsidy payment at the end of March will receive a cash advance from the Scottish Government. The First Minister has confirmed the Scottish Government will use up to £200 million of national funds to provide cash support while Common Agricultural Policy (CAP) claims are being processed. “This is a welcome move from the Scottish Government and the First Minister. “The transition to a new, more complex CAP that is affecting payment schedules right across Europe is happening as farmers and crofters are dealing with poor market prices and challenging weather conditions. “We are less than half way through the payment window allowed by Europe, and the majority of Scottish producers – more than 10,000 – have already received a subsidy payment. However, payments are not being made as quickly as we would like. Rural Affairs Secretary Richard Lochhead has confirmed that today’s announcement will also enable Scottish Beef Scheme payments to be made in the middle of April, in line with previous years. It comes just days after the Cabinet Secretary announced national funds will also be used to ensure hillfarmers and crofters in Scotland’s most fragile and remote rural areas who rely on Less Favoured Area Support Scheme (LFASS) funding will receive a payment in March as usual. “In Scotland, we are implementing decisions taken with the industry to tailor the policy to deliver better outcomes for Scottish agriculture. I have always been clear that adding this extra complexity would prove extremely challenging to implement, but it is taking longer to make payments than we had hoped. “Europe’s deadline for making direct payments is June 30, and the majority of Scottish farmers and crofters have now received a first instalment worth about 80 per cent of their basic and greening claim. 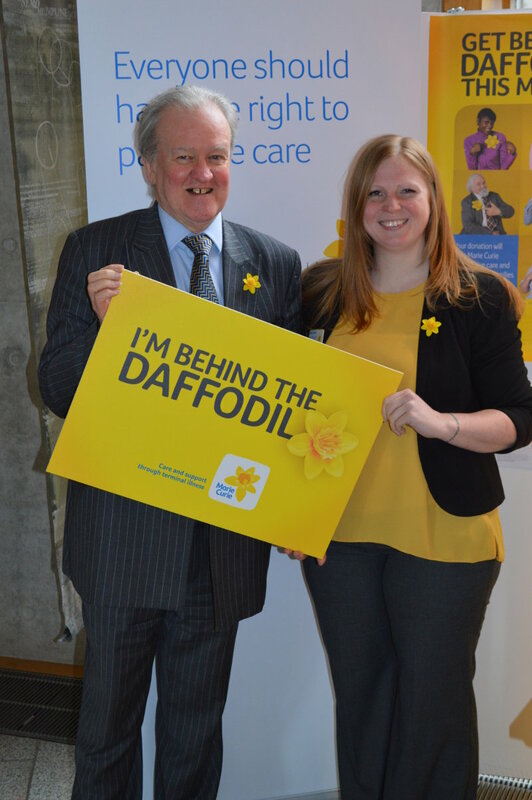 Local SNP MSP Stewart Stevenson got behind the daffodil to lend his support to the Great Daffodil Appeal at the Scottish Parliament this week. Mr Stevenson met staff and heard about the work of the charity that last year provided care and support for more than 7,400 people living with a terminal illness in Scotland. “Marie Curie has 2000 nurses in the UK and provides care and support for more than 7,400 people living with a terminal illness across Scotland. To support the Great Daffodil Appeal call 0845 601 3107 (local rate) or pledge £5 by texting DAFF to 70111. Visit www.mariecurie.org.uk/daffodil. The North Sea would be an “ideal location” for storing carbon dioxide, a report by the Global CCS Institute has said – putting further pressure on David Cameron to U-turn on his betrayal on investment in Peterhead. The intervention comes as the deeply unpopular Prime Minister visits Scotland for the Scottish Tory conference. Cameron betrayed an election vow to invest £1bn in Carbon Capture and Storage technology which was widely expected to be based in Peterhead. The broken promise has cost 600 jobs in the North East while shirking the UK’s responsibility to tackling climate change. “This intervention has added weight to the growing criticism of the Prime Minister’s betrayal to the North East. “Peterhead was expecting to benefit from huge investment, creating hundreds of jobs in a cutting edge field. Yet the miserly Prime Minister has betrayed his election promise – hurting the local economy as well as our planet. Stewart Stevenson, MSP for Banffshire & Buchan Coast, this week asked the Minister for Business, Energy and Tourism, Fergus Ewing, what the Scottish Government were doing to support tourism in Aberdeenshire. Banffshire & Buchan Coast MSP Stewart Stevenson has welcomed figures which show that the North-east has received nearly £5.5million from the Scottish Government’s ‘Cashback for Communities’ scheme. 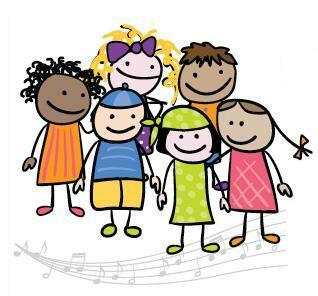 The scheme is a Scottish Government programme which takes funds recovered from the proceeds of crime and invests them into free activities and programmes for young people across Scotland. Up to March 2015, £5.5million recovered under the Proceeds of Crime Act has been committed to the Cashback for Communities Programme and other community initiatives in the North-east. The total number of activities the programme has funded in the North-east is over 250,000. Banffshire & Buchan Coast MSP Stewart Stevenson will be hosting a meeting for local fishermen and those involved in the fishing industry on Friday (4 March). Fisheries Secretary Richard Lochhead MSP will address the meeting and will take questions from the floor. The meeting will be chaired by Stewart Stevenson and the event takes place on Friday 4 March at 4.00pm at Findlay’s Hotel, Smiddyhill Road, Fraserburgh. “I’m very pleased that Richard Lochhead has again agreed to do another of these events in my constituency. The idea originally arose out of a conversation with one of my constituents on fishing issues and we tried this out a couple of years ago and got a very good turnout, so we were keen to offer people the opportunity once again. Those wishing to attend are asked to e-mail msp@stewartstevenson.scot to register their attendance.